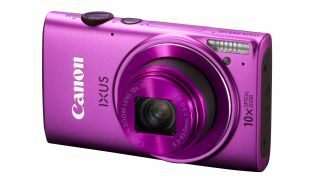 Canon has introduced new cameras into its IXUS and PowerShot line-up of compacts, with some including built-in Wi-Fi. Four new cameras have been added to the range. The IXUS 135, IXUS 132 and PowerShot A2500 all share the same 16 million pixel sensor and DIGIC 4 image processor, which is designed to help produce low noise images with plenty of detail. The IXUS 255 HS has a 12.1 million pixel CMOS sensor and Digic 5 processor - the same processor which is found in many of Canon's top-end models. The IXUS 255 sports a wide angle 24mm (equivalent) lens with a 10x optical zoom, while the IXUS 135 and IXUS 132 feature 28mm (equivalent) lenses and an 8x optical zoom. All of the IXUS cameras have the same slim and stylish design that the IXUS range has become known for. Canon's Advanced optical Image Stabiliser is available on the models. This selects from seven different modes to combat camera shake and ensure smooth video. Each new model features ZoomPlus technology, a digital zoom which is designed to maintain image detail. The new models feature Smart Auto mode, which has the ability to detect up to 32 different scenes to apply the most appropriate settings. Creative modes like Miniature Effect, Toy Camera, Fish-eye and Monochrome are also available. The IXUS 255 also includes a new Hybrid Auto mode, which uses Smart Detection technology to provide the optimal settings while also capturing up to four seconds of movie footage prior to the shutter being released. Those movie clips can then be merged into one movie at the end of the day. Wi-Fi technology is included in the IXUS 255 HS and IXUS 135. This enables wireless connection to smartphones or tablets for quick uploading of images to social network. GPS tagging is also available. The IXUS 255 HS features a 3 inch Pure Color II G LCD screen, while the others use a 2.7 inch LCD. Pricing and availability for the new cameras has yet to be announced.